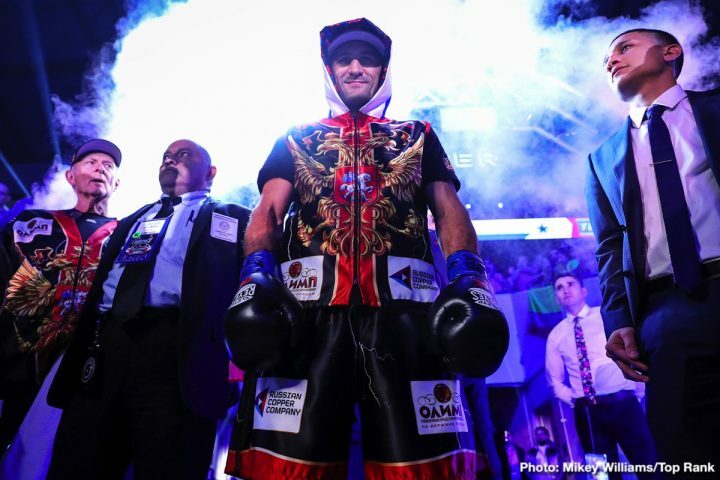 By Jeff Aranow: Main Events CEO Kathy Duva says WBA super middleweight champion Callum Smith (25-0, 18 KOs) is on the wishlist of WBO light heavyweight champion Sergey Kovalev, and he has been for a long time. Smith wants to be involved in unification fights at 168. If those types of fights aren’t available to him, then he’d be interested in moving up to 175 to take on Kovalev (33-3-1, 28 KOs) for his WBO title. Joe Gallagher, the manager/trainer for Callum Smith, says he’ll move up to 175 if they can’t get a dance partner at 168 in terms of other champions agreeing to fight him. Gallagher isn’t saying, but he has to view Kovalev as a vulnerable champion for him to want to have Smith take a big risk in fighting him. Up until Kovalev’s last fight against Eleider Alvarez, he’d been struggling in fights against Alvarez and Andre Ward. He lost to both of those guys after running out of gas. Smith, 28, is promoted by Matchroom Boxing, and it might be a little complicated to put a fight together with the Top Rank co-promoted Kovaelv. If Smith’s promoters Barry and Eddie Hearn insist that he only fight on DAZN, then that could be a problem in making a fight against Kovalev, who fights on ESPN now. The 175 lb weight division might be a better option for Callum if he wants to get big fights. The super middleweight division is barren of big names at this time. Only Saul Canelo Alvarez is considered popular right now. The 160 and 175 lb weight classes are much better divisions in terms of big names. Callum obviously can’t fight at 160, so 175 is the best plan for him if he wants to fight the dangerous guys like Kovalev, Artur Beterbiev, Marcus Browne, Oleksander Gvozdyk and Dmitry Bivol. Smith needs to have his head on straight before he makes the decision to move up to light heavyweight. Those are guys that come from excellent amateur backgrounds in Russia and Ukraine, and they’re not going to be bowled over so easily like the guys that Callum has been fighting throughout his pro career. Gallagher mentioning Kovalev as the guy they want has to be seen as a big hint that Bivol, Beterbiev and Gvozdyk are bad match-ups to Smith. Those guys can do everything Smith can do. They hit as hard if not harder, and they’re rugged. We don’t know how good Smith’s chin is because the only puncher he’s faced during his career was George Groves, and he was coming off a bad shoulder injury. Smith is coming a career best win over George Groves last September in the World Boxing Super Series 168 tournament. Smith won the Muhammad Ali Trophy with his seventh round knockout win over Groves. Now that the tournament is over, Smith is looking to make his next move, and he’d like to take on super middleweight champions Gilberto ‘Zurdo’ Ramirez, Caleb Plant and Saul Canelo Alvarez. With Callum being considered far and away the best fighter at 168. Given the odds of beating Smith are low, it probably doesn’t payoff to take a fight with him if you’re one of the world champions at super middleweight. The 168 lb belt holders would almost surely need to travel to the UK to fight Smith in his backyard in Liverpool, England in front of a football stadium fool of Callum supporters. It’s a better deal for for the other super middleweight champions to defend against the mostly beatable challengers than for them to sign for a unification fight that they would have a difficult time winning against Smith. If the money the other champions could get in facing the 6’3″ Callum was out of this world good, then it would be a no-brainer for them to agree to fight him. It wouldn’t be life-changing money for the 168 lb champions to take the fight with Smith, and potentially lose their title in the process. The smart thing for the other champions is to make easy title defenses for whatever money they can make in those fights rather than taking a major risk in traveling to the UK to fight arguably the best fighter in the 168 lb division in Callum. If the the shoe was on the other foot and Callum was being asked to fight someone that is better than him in their own country, he and his management might not be so eager to take that fight. Kovalev, 35, looked sensational earlier this month in boxing his way to a one-sided 12 round unanimous decision victory over WBO light heavyweight champion Eleider Alvarez (24-1, 12 KOs) on February 2 in Frisco, Texas. The victory for Kovalev avenged his 7th round knockout loss to Alvarez from last August. The difference in the performances by Kovalev was pretty dramatic. Instead of trying to slug with Alvarez to knock him out, Kovalev boxed him for 12 rounds, and made it look easy. When Kovalev is staying at range and boxing his opponents, like he did against Bernard Hopkins in 2014, he’s very hard to beat. Even someone like Andre Ward would have a lot of problems with Kovalev when he’s fighting like that. If former World Boxing Council super middleweight champion David Benavidez (20-0, 17 KOs) wins his WBC title back, he would likely readily agree to a unification fight against Smith. However, it’s going to take a while for Benavidez to recapture his WBC belt. #1 WBC Anthony Dirrell and #2 Avni Yildirim will be fighting for the vacant WBC super middleweight title this month on February 23. The winner of that fight is supposed to face the 22-year-old Benavidez next. That contest will likely take place in the summer. If Callum is willing to stay patient for a while, he could have a unification fight against the 6’2″ Benavidez later on this year. That’s a tough one though for Callum. Benavidez is young, he can punch with either hand, and he throws a lot of shots. Benavidez trains a lot, and he’s not someone coming off of an injury like Groves was when he beat him.